Your child’s baptism is a time for celebration and joy. And, naturally, you want the best for your baby. We hope to help you plan and prepare for baptism in the best possible way. We usually conduct Baptisms for children in a special service at 12.30pm on the first and third Sundays of the month and there will often be two families at that service. It is also possible to have a baptism service in the main service at 10.30am. If you do not live in the parish of Shifnal, and are not a regular worshipper with us we will ask you to come to worship for three weeks to get to know us, and then we will be happy to arrange a baptism. We have a baptism preparation morning and rehearsal on the fourth Saturday of each month, and a team of baptism visitors who will be pleased to help you to prepare for the day. In choosing Godparents we suggest that three will be sufficient, and we have a maximum of four Godparents for each child. To be a Godparent you must be baptised yourself, but we do invite people who have not been baptised, or who are of another Faith to stand as a Witness or a Sponsor. Baptism is only the start of what it is to be a Christian. There are many opportunities for children and young people, and we would like to support you in helping them to grow in faith. Occasionally we are asked for a service of dedication and naming instead of Baptism. We are very happy to help in this way if that seems appropriate to you. Just ask about the service for more information. Today we also have many people asking to be baptised as Adults, and we would be pleased to discuss the options with you for how this might take place. For some people it is enough to take this first step, for others they will be Baptised and Confirmed at the same time by the Bishop. We offer a number of ways to explore the Christian faith and to prepare yourself to make this act of adult commitment. Do ask for the full information sheet about Adult Baptism. Please contact Wendy our parish administrator Tel. 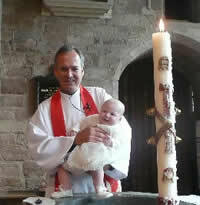 01952 291532 office hours Monday – Thursday, 10am – 2pm or by email on admin@shifnalbenefice.org.uk to arrange a baptism / wedding.